The black, Axis 32L Backpack from Tenba is modeled after tactical, military backpacks and is designed to comfortably and securely carry your mobile photo studio. Its spacious main compartment features an adjustable partition system that holds a DSLR with a 400mm f/2.8 lens, six to eight additional lenses, and a shoe mount flash or a folding drone kit. Users of mirrorless camera systems can fit up to seven to ten lenses along with a camera, plus a flash or a folding drone kit, as well as a backup camera. Complete access to the main compartment is provided by a rear-facing zippered panel with a 180° downward opening, while two additional zippered openings allow items closest to the top and the wearer's left side to be reached. By rotating the Axis 32L Backpack from one's back to front with its left side facing upward, the wearer can open this bag without having to fully remove it. To help maximize the versatility of the Axis 32L Backpack, MOLLE-compatible loops are distributed along the front panel and side opening. These MOLLE-compatible loops allow for the attachment of MOLLE accessory pouches and containers, including separately available Tenba Tools lens capsules, battery pouches, and memory card wallets. Additionally, the MOLLE-compatible loops include reflective stitching that enhances safety by helping to ensure that the wearer remains visible to vehicular traffic under low-light conditions. The front panel also unzips to reveal multiple organizational pockets and offers capacity for hard drives, a smartphone, pens, notebooks, or a map. The inside of the top zipped opening includes a small pocket for items that need to be accessed quickly and conveniently, such as portable batteries, camera filters, or other small electronics. Along the inside of the rear-zippered panel is the Axis 32L Backpack's 17" laptop sleeve which features a touch-tab retaining strap. 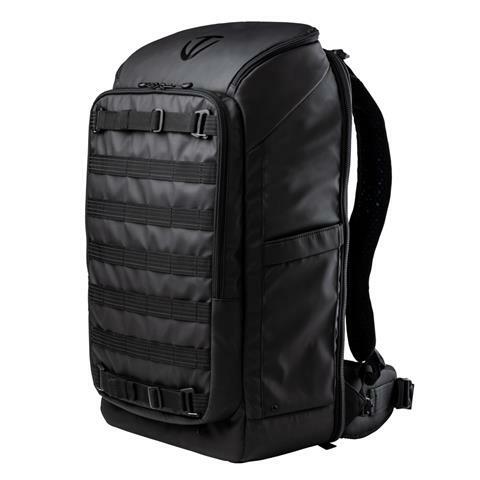 The Axis 32L Backpack can be carried using its built-in top handle, or by its padded shoulder straps which can be adjusted upward or downward for a better fit. For heavy loads, this backpack's removable waist belt transfers weight to the hips for additional comfort, while the sternum strap further limits unintentional shifting around the wearer. Along the front of the Axis 32L Backpack are two MOLLE-compatible compression straps that can each hold and secure a tripod, monopod, or trekking pole; while a large side pocket along the wearer's right side can accommodate a water bottle or another similarly sized item.